I woke up at 5:45am before my alarm clock (mind is buzzing!) so here I am sipping my coffee and telling you about all the latest yummies in food and fashion with Country Kind of Love Spotify in the background. Not mad about it. Toast breakfast! I shared Jeff’s eggs while he was eating since I didn’t have time to make my own and then settled on two pieces of Alvarado Street sprouted flax bread from Trader Joe’s plus coffee. 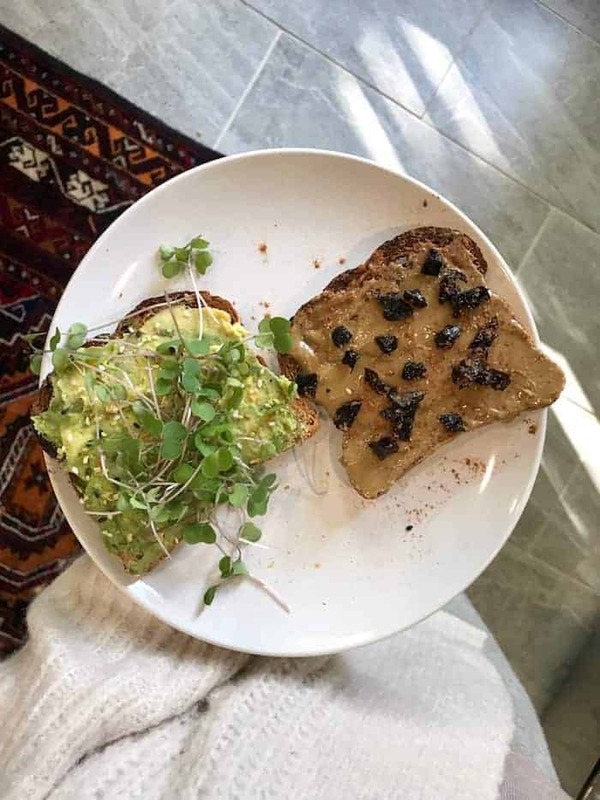 One had avocado, everything bagel spice, and micro greens and the other had sunflower seed butter, salt, cinnamon, and Sunsweet diced prunes. 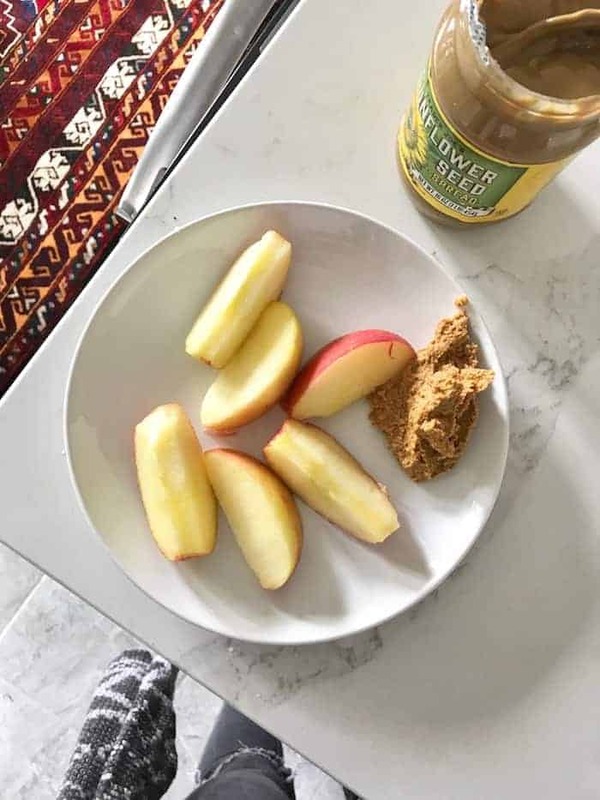 I’m so in love with Trader Joe’s unsweetened sunbutter lately on toast or apples. Also totally into prunes! They’re sweet and juicy and actually really good for bone health. Eat up! Lunch was a hearty bowl of leftover Meaty Beany Chili with Corn Muffins. 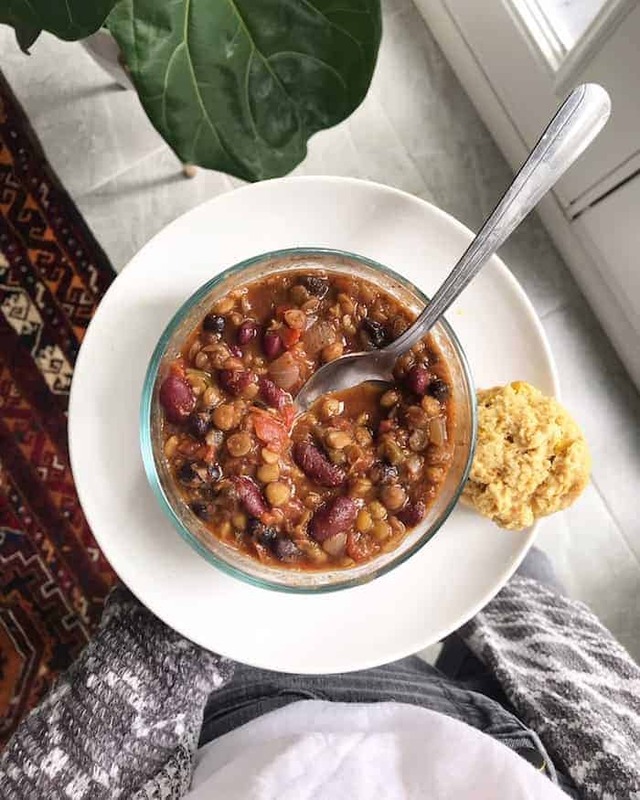 I adore all of Isa Chandra’s recipes and she’s the chili queen. A bit after I enjoyed a sliced organic honey crisp apple with more sunbutter and my Pumpkin Cheesecake Dip. Have you made it yet? I’m in love! 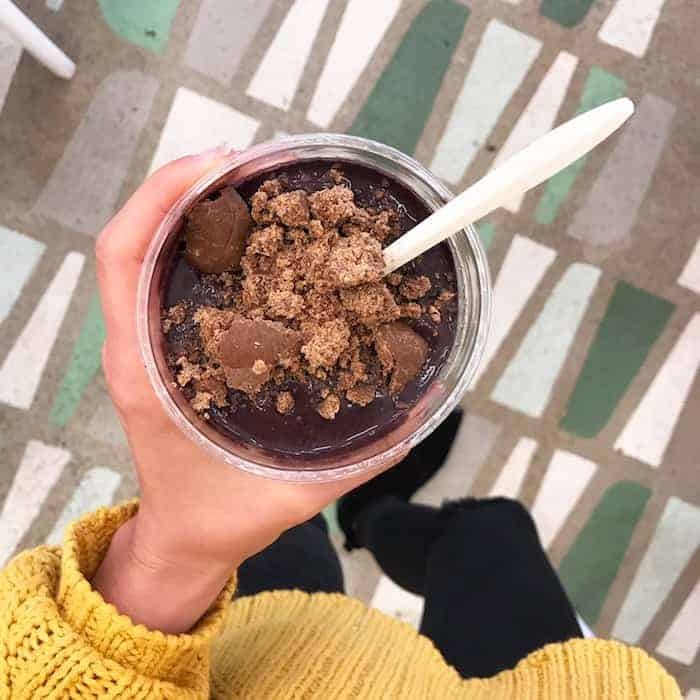 I popped into our Grandview Alchemy location mid afternoon and was super hungry around 4pm (hello, light breakfast) so I made my favorite blueberry cacao smoothie with a crumbled peanut butter cacao no-bake bite on top. Smoothie deets: 1 cup frozen blueberries, 1 scoop chocolate plant protein, 1 tbsp cacao, 1/4 an avocado, splash of vanilla extract, handful of spinach, and about 10oz almond milk. For dinner I made up a baked cod and veggie dish that ended up being shockingly delish. First I defrosted 2 lbs of frozen wild cod fillets from Costco. To defrost quickly, put the sealed fish in a big bowl with water, changing it a couple times until it’s defrosted, for about 20 minutes. Then I chopped up a carton of local grape tomatoes, thinly sliced Brussels sprouts, and a green pepper then tossed them with plenty of extra virgin olive oil, kosher salt, garlic powder, and pepper. in a 9×13 inch glass baking dish lined with parchment paper for easy clean up. I also threw in a handful of capers. I roasted the veggies at 425F for 15 minutes. While they cooked, I sautéed a bunch of chopped kale in olive oil, salt, pepper, and garlic until wilted and added a splash of red wine vinegar at the end. Then I microwaved a huge sweet potato. For the topping, I chopped up a bunch of these marinated artichoke hearts (probably 2 cups), and added a handful of fresh chopped dill and prunes (I know, again with the prunes!). 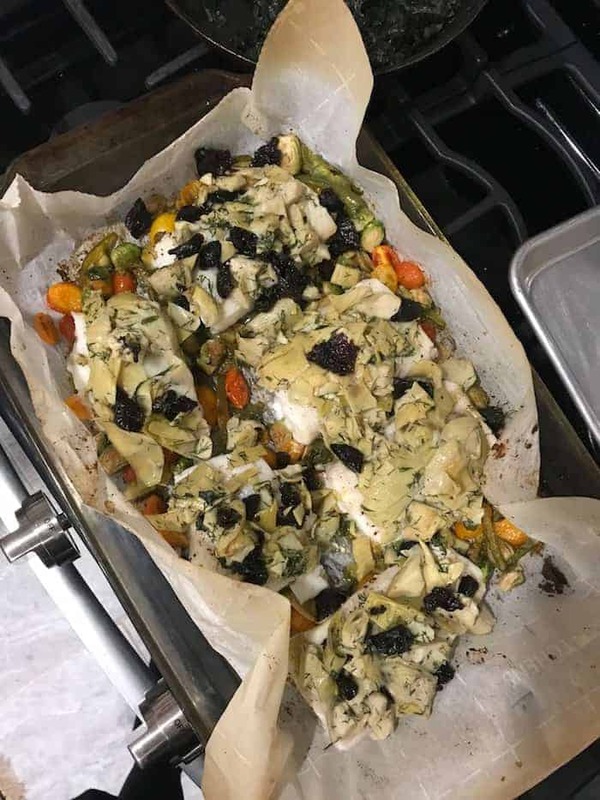 Once the veggies were done, I placed the 6 pieces of fish on top, drizzled with olive oil, salt, and pepper, and put the artichoke mixture on top of the fish. Turn the oven down to 400F and bake for 10 minutes. This was a pretty easy meal, made enough to last me and Jeff for two nights, and was INSANELY TASTY. You could use whatever veggies you want on bottom, like zucchini, mushrooms, squash, or whatever is in season. For dessert we’ve been loving a few of these crunchy double chocolate cookies. So easy and yummy with a glass of chilly almond milk before bed. Who’s coming to my event with Simple Mills this Sunday?! Onto some style inspiration for the week! My favorite yellow cable-knit sweater making another appearance. It has more of an oversized fit so size down. Yellow is almost sold out but also love it in white. Paired with ripped black jeans and my favorite black pointy booties that I have in two colors. Burgundy jeans, white v neck, tortoise earrings, same boots as above in cloud suede, and cozy vest. Also obsessed this amazing mustard cardigan and this cozy white cardigan is 40% off! Striped tee, oatmeal cardigan, santos hoop earrings, black jeans, pointed toe mules (similar). Baublebar is having an awesome sale if you’re in the market for earrings! Use code NEW20 for 20% off or NEW30 for 30% off $50 or more. I own these colorful hoops and these black fringe earrings are the bomb, too! Adidas tank, high waist street style leggings, gray hoodie (40% off), backpack, baseball cap, and lastly, MAJOR SALE ALERT! My favorite black Frye boots are 53% off and that NEVER happens. These are super high quality leather boots that’ll last forever. For a slightly taller look, these Frye boots are 57% off! I just got this boxy knit sweatshirt from Nordstrom Rack and it looks adorable with leggings. It runs big so size down. Also got this high low plaid ruffle tunic and I’m in love. It’s super comfy! Deals of the day: This gorgeous cocoon open front coat for $44.97. Buying it in camel and love the gray too! Also this faux suede modo jacket is originally $98 and on sale for $29.97. Love the blush color! Madewell is having an extra 30% off sale on sale items with code ORDERUP. I’ll take this lavender hem ruffle stripe top, please. Have an amazing week, good people. I love prunes! They’re my favourite dried fruit to snack on, but I often can’t control myself when it comes to portioning… I always end up devouring the whole bag, haha! Matt and I love prunes! Super juicy, sweet and delicious in many dishes. We’ve run out, sadly, but after restocking, I’m going to start adding them to savory dishes more often! Love all of your meals. 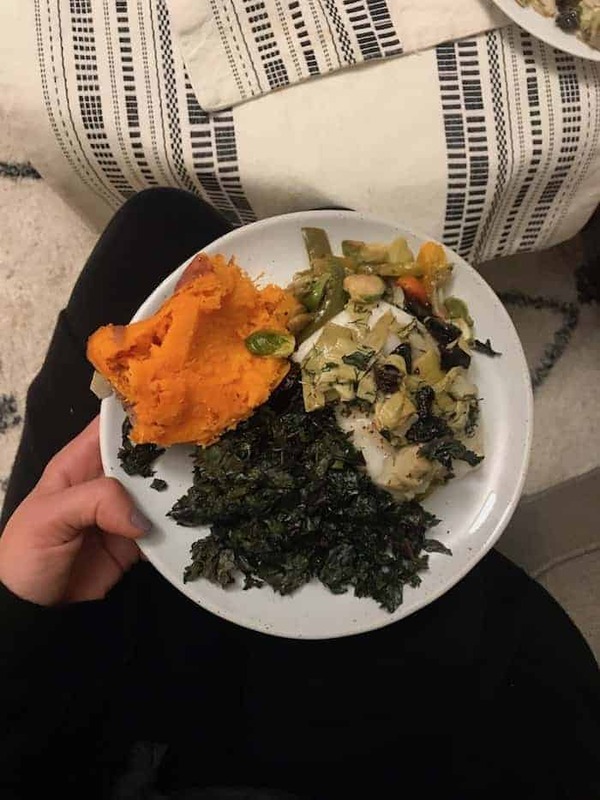 I saw your Ig stories of the cod dinner, and all of those flavors together sounded ah-mazing. Love love your style inspo! That mustard caridgan is perfect. Mustard is one of my absolute favorite fall colors. When Kaci and I were at Old Navy last Saturday, I saw this plaid top that made me think of you. :) https://oldnavy.gap.com/browse/product.do?vid=1&pid=340107022&searchText=plaid+top Have a wonderful day! I have been all about the blueberry smoothies lately – I need to try your recipe! Sunbutter is sooo yummy – why haven’t I tried TJ’s version?? Thanks for sharing all the good fashion deals, btw. Fall clothes are THE BEST because layers!